Line large cookie sheet with waxed paper. Unroll Fruit Roll-Ups™, one sheet at a time. 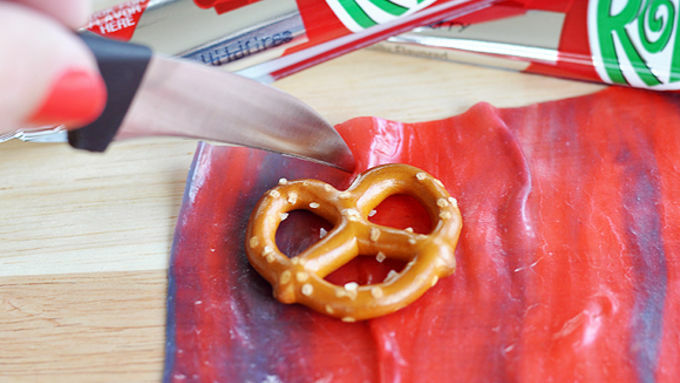 Trace each small pretzel on the Fruit Roll-Ups™ with a sharp knife. Remove shape and press firmly to back of pretzel. Continue until all pretzels are covered. Place pretzels in pairs on waxed paper, with bottom tips touching as shown to form wings. Cut 10 Gushers™ fruit flavored snacks in half to make 20 halves. Set aside. In a microwave-safe bowl, melt white chocolate chips on high for 30 seconds. Remove from micro, stir, and return to micro for up to another 30 seconds until chocolate is melted completely and can be stirred smooth. 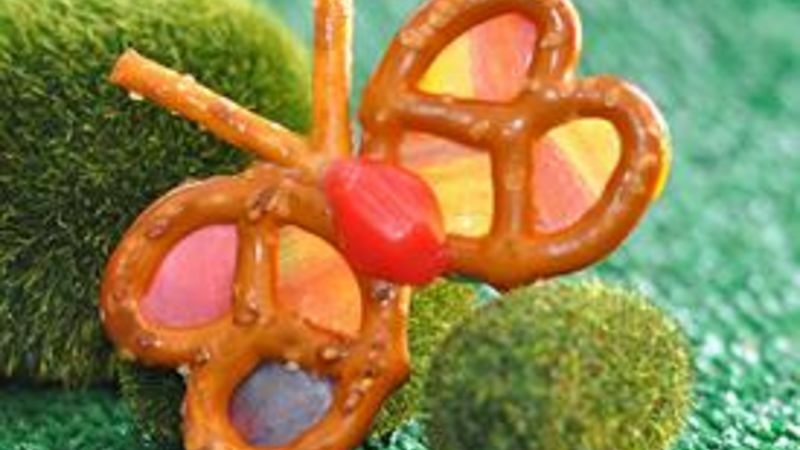 Using a small spoon or pastry bag, dab chocolate to join each pretzel set to make a butterfly. Before the chocolate sets, add a Gushers™ half, cut-side down, to make the butterfly body. Snap remaining pretzel twists (or pretzel sticks) into anntena size. Dip one end of each piece into the melted chocolate and place on the butterflies. Allow chocolate to harden completely before removing from wax paper. Use the melted white chocolate to adhere a sucker stick to the bottom of the butterflies. When set, these can be placed in a small Mason jar, clay pot or other decorative vase for a great display. Use sugar or clean floral gems to keep the sticks in place. Do each section in a separate Fruit Roll-Ups™ color. I used a tiny heart-shaped cookie cutter to cut 3 pieces for each wing (6 for each butterfly), then pressed each piece to a separate section so they looked like stained glass windows. Butterfly season is back! And you don't even need a net to catch a batch of these li'l perties. I used to be obsessed with butterflies when I was a baby. That's how the family story goes, anyway. Mom told me that I'd stare at a butterfly mobile for hours and hours. B.O.R.I.N.G. What a yawnster youngin. Well at least I grew up to make exciting snacks! These colorful butterflies are the edible variety. So their scientific name would be edilicious flutterbyus. 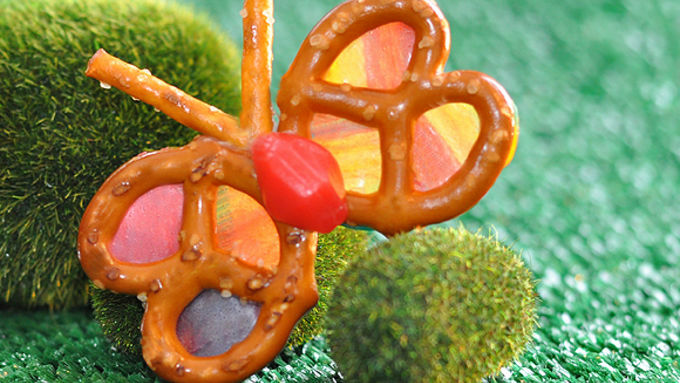 Here at Tablespoon, we call 'em Rainbow Pretzel Butterflies -- and you can make them too. These are so super cute and easy. Grab a kid to help and let's fly! Look for the Fruit Roll-Ups with mixed colors, like Blastin' Berry or Tropical Tie Dye. I used a tiny heart cookie cutter, so I could get different colors on all the wing sections. If you have a mini cookie cutter, the kids can help with this step. No heart cookie cutter? NO WORRIES! 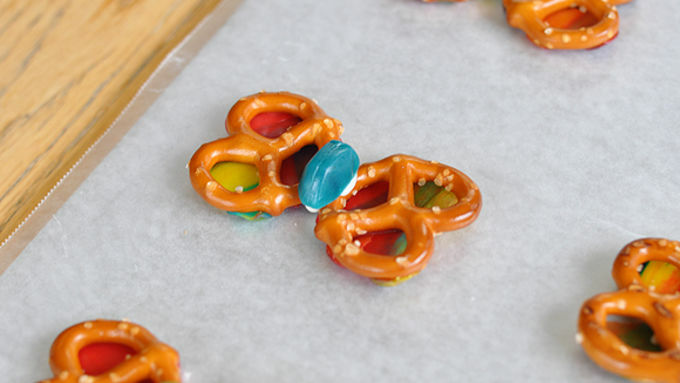 Just trace around a mini pretzel with a sharp knife. Do each section in a separate Fruit Roll-Ups™ color. I used a tiny heart-shaped cookie cutter to cut 3 pieces for each wing (6 for each butterfly), then pressed each piece to a separate section so they looked like stained glass windows. Here's a perf party idea -- add sucker sticks to 'em with more melted white chocolate chips, and display them in a little bucket, small Mason jar, clay pot or other decorative vase for a great display. Use sugar or clean floral gems to keep the sticks in place. Go ahead, fixate on them. I am! I'm in awe that I MADE THESE. Guess I'm not so boring after all. Hmmm...maybe I should make a mobile out of them?